Artwork Panel: 28.4cm x 40.9cm ≈ 11¼" x 16"
Silk/Brocade: 37.4cm x 103.3cm ≈ 14¾" x 40¾"
Takeda Nobushige is known as one of the "Twenty-Four Generals of Takeda Shingen" or the "Kai General". Original artist: Utagawa Kuniyoshi (歌川 国芳) (1797-1861). Original woodblock was created in Japan, around 1853. Takeda Nobushige (1525-1561) was a samurai of Japan's Sengoku period, and younger brother of Takeda Shingen. Takeda Nobushige held the favor of their father, and was meant to inherit the Takeda lands, wealth and power, becoming head of the clan. However, Shingen rebelled against their father and seized the lands and power for himself. Nobushige nevertheless fought alongside his brother who relied on him for support, He is famous not only for his strategic insight but also his wisdom; he wrote among other things Kyūjūkyū Kakun, a set of 99 short rules for Takeda clan members, some of which are erroneously attributed to Shingen himself from time to time. 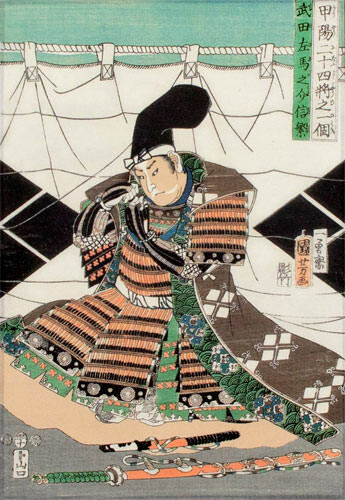 He is also known as Takeda Tenkyū (Tenkyū being another rank he held). Nobushige became an important Takeda general and led large forces on several occasions. In 1544, Shingen had a rebellion on his hands. As part of his punitive effort he sent Nobushige to capture Fujisawa Yorichika's Kōjinyama castle. (He probably succeeded, though sources differ). Katsurao castle, main castle of Murakami Yoshikiyo, fell to Nobushige and Takeda Yoshinobu in 1553. This drove Yoshikiyo to Uesugi Kenshin and was really the last significant act before the start of the Kawanakajima campaigns proper.